Toshiba B-SV4D - Direct thermal desktop printer with cutter, 4" wide, 203 dpi, 5"/sec. RS-232C + USB + Parallel interface. Perfect for retail, ticketing, transportation, and hospitality applications, the B-SV4D delivers quality and performance that won't break the bank. This 4" wide direct thermal barcode printer is full of features that outperforms other printers in its class. Its rugged and attractive double-walled construction make the B-SV4D tough enough for transportation applications, yet attractive enough for retail environments. Featuring serial, parallel, and USB standard, the B-SV4D is capable of printing up to 5 ips. 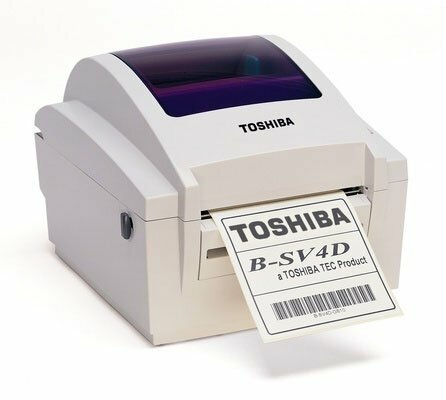 The B-SV4D is backed by TOSHIBA TEC's standard 1-year warranty on parts and a 1-year or 1 million print inches warranty on the thermal head. Day to day operation of the B-SV4D is user-friendly. The clam-shell design makes loading media easy. A wide-open design grants easy access to the printhead and platens, which can be replaced without the need for a screwdriver. 4.17" x 1,969' Wax-Resin RIBBON, 5 ROLL CASE, FOR B-SX4/SX5/472/572/482 PRINTERS. Also available as a single roll (Part# BX760106AG2E-R). Black ribbons, 8.66" wide, 5 roll case. (For B-SX8 / SX6 / 882 / 872 printers). Also available as a single roll (Part# BX730220AG2-R). RESIN RIBBON, 2.36" x 1312'', 1" CORE, B-SA4TP/4TM COMPATIBLE, 10 rolls/case. WAX RIBBON, 4.33" x 1968', 1" CORE, B-EX4T2 COMPATIBLE, 10 rolls/case. Also available as a single roll (Part# BEX60110AW5F-R). The Toshiba B-SV4D-GC10-QM-R is also known as B-SV4D-GC10-QM-R	or BSV4DGC10QMR	.